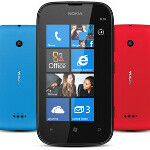 A video from China shows the low-end Nokia Lumia 510 running Windows Phone 7.8. Expected to launch in the country before the end of the year, this low-end model has a 4 inch WVGA LCD screen with an 800MHz Qualcomm Snapdragon S1 processor, 256MB of RAM, a 5MP rear facing camera and a 1300mAh battery. Since it runs Windows Phone 7.8, the phone displays the new Start screen with different tile sizes, new accent colors and the Bing lock screen wallpaper. Windows 7.8 will eventually make its way elsewhere as an update to Windows Phone 7.5 handsets, and could be launched sometime in the next few weeks. That might not make owners of Windows Phone 7.5 models completely happy since they are not getting the full Windows Phone 8 treatment, and are locked into their current devices for more than a year. Recently, some leaked slides show that for those legacy Windows Phone models, there will be some life after Windows Phone 7.8. I don't know but it's obvious that people will choose the low end Android over it. They need to come up with something really different thing, differnet idea and much more differnet technology in order to get back it's name and position. It's sure it will take a lot of time. agreed.. WP is too smooth and no backgroung applictaion problems. android is left behind from microsoft's class. Sounds like you never used any low end Android handset. They are not that cheap and still lag horribly. What I was thinking. They can really do some cutting here and there and make a better budget device. How much will including 512 MB RAM cost them? Not much. And the smaller 3.7" display was good enough. I haven't tried Windows Phone 8, however WP7 has been far more reliable and bug-free than any other Android product that I've had. Windows may not have the apps but a crash-free gadget does have its advantages. Funny how tech sites never mention the fact that 75% of android users cannot install updated google services such as google NOW, Chrome web browser, google calendar, and YouTube for Google TV.